Distribute a class set of Pajaggles (Large foam puzzle pieces with inserts) equally to each of the six teams lined up in relay style. If your largest team is six players, then all teams will take six pajaggles. The object of the game is for your team to fill up all of your team’s pajaggle rings. Then see how fast the whole class can complete filling all of the rings for all of the teams. Lay the six pajaggles next to your relay team. Pull out the inserts and everyone walk to the center line, close your eyes and fling the insert as far as you can. Teams go back to their relay team. On the teacher’s signal, the first person on each team runs to the inserts at the opposite end of the gym. Pick up one insert and return to your relay team. Give the next person on your team a high five they continue looking for inserts that fit your rings. If the insert fits, then you keep it. If the insert does not fit, hand it to the next person on your team, who will fling it after they get a high five for their turn. They run back to their line and give a high five to the next person in line. Continue until all of the pajaggle puzzles are solved. How long does it take the whole class to get all of their puzzles solved? The class is divided in half. One half of the class are the chasers and the other half is the puzzlers. The puzzlers sit around the center circle in the gym. 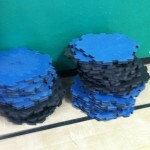 The pajaggles are set up at one end of the gym with the inserts taken out. The chasers line up their relay teams, so they can easily pass beside the puzzlers in the center of the gym. On teacher’s signal, the chasers run one at a time to pick up one piece at a time and hand it off to the puzzlers. The puzzlers will begin to put the pajaggles together in one giant puzzle. Chasers continue running until all of the pieces are in the center of the gym. Puzzlers continue until the giant puzzle is put together. The teacher stops the time when everyone is sitting down and the puzzle is completed.